Do you need a roofer that can supply you with residential or commercial roofing in Willis, TX? Contact ECO Commercial Roofing today at (833) 200-0571 for the high-quality roof services you need! Our expert roofing contractors are talented at delivering excellent roof services, but we’re specialists in customer service. We’re active members of our community, and we have been dependable Willis roofers for a long time now. Our roofers are always happy to assist our clients with any inquiries or worries about roof systems, and we supply a variety of solutions as well. Anytime you’re looking for a smarter roof experience, contact the professionals at ECO Commercial Roofing for help. A trustworthy contractor is essential when it comes to any services for your house or business. Each of our contractors is educated to industry standards, and we use solely the highest quality of roofing materials. Because the type of roofing you install can alter the value of your building for years to come, we are sure to stock large selections of materials and styles for you to choose from. Everyone enjoys a particularly stylish roof, but be sure to consider all of the long term perks involved, too. The kind of roof you pick will ultimately rely on your budget, and the type of building you are looking to protect. We have tons of reliable options to pick from. We supply reliable roof repairs, roof replacements, and roof installations too. Regardless of which kind of roof project you need, from commercial, to residential, and even industrial, we have the services you’ll need. Our commercial offerings are ideal for businesses, shopping centers, apartment complexes, and similarly designed buildings with flat roofing. Flat roofs can be a bit tricky, and without expert installation, you might be stuck with leaks or ponding. Industrial roofs, though similar to commercial roofs, actually need stronger materials, and extremely skilled installation to ensure longevity. Last but not least, our residential roof services can help with a variety of residential roof styles and materials, with everything from repairs to installations. Roof restorations are our number one specialty, meaning we’re no strangers to roof coatings. We have decades of expertise with roof coatings, and we know that utilizing top quality products such as Conklin can make all the difference when a project is finished. If you need better roofing in Willis, TX, you can depend on us to provide you with unbeatable craftsmanship, and top quality services. If you’re interested in learning additional information about how roof restoration with Conklin products can prolong the life of your roofing system, give us a ring now at (833) 200-0571, or check out the links provided! If a roof is approaching the end of its lifespan, you can typically choose to replace it or to restore it, and we often advise restoration. Properly done, one of our Conklin roofing restorations can add an additional 10 years to the life of your roofing! Save yourself time and money by choosing a quality roof restoration in place of a roof replacement. 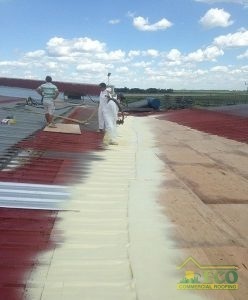 Conklin roof coatings are the preferred method of roof restoration. It can be hard to decide which roof coating is ideal for your needs, when presented with the wide selection of options, but our professional roofers are here to help! The type of roof coating you need will depend on the make of your current roof, in addition to the problems your roof faces most frequently. Thanks to the specialized design, your roof coating will likely be applied directly over the existing roofing system. Call (833) 200-0571 to speak to a roof expert about your roof coating options. Acrylic Roofing Changing temperatures need your building’s roof to expand and shrink, and acrylic is well suited for varying adjustments. Elastomeric Roofing There are several elastomeric roof coatings to pick from, and they all offer fantastic protection. 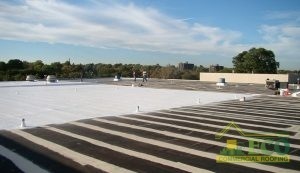 We service several kinds of commercial roof options, such as flat roofs as well as low slope roofs. Keep in mind that your first line of defense against leaks and early roof failure is a dependable and expert installation. When we create a flat roof solution for a client, we build that solution to defend and serve their structure for decades. Contact ECO Commercial Roofing when you need residential and commercial roofing services you can count on to defend your roof system for years to come. You can ask for our resilient roofing in Willis, TX, as well as the surrounding areas. Spending money on a reliable roof for your building will undoubtedly benefit you later on in that business. Give us a ring today at (833) 200-0571 with roofing questions, or if you would like to schedule your Estimate with our qualified roofers.